Great photo of Elizabeth at Trafalgar Square Mark. It's so nice to see you back to posting in this thread. For some reason Camelot has been stuck on my brain for most of the day! I would post more but my photobucket is not cooperating with me tonight. I voted for Who's Afraid of Virginia Woolf? I've seen other Taylor-Burton productions, but I would have to say this one stands out above the rest. There performances here are top-notch; perhaps their greatest performances. 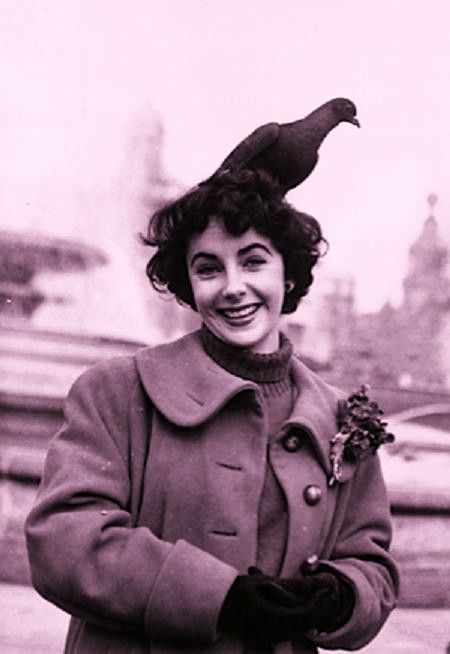 Elizabeth Taylor ascended into heaven 6 years ago today. Well said Mark. It's weird but I remember that day as vividly as if it had been yesterday. That's an excellent choice Classyco. It was "Who's Afraid of Virginia Woolf?" that gave me a taste to watch more of their work and now 9 years later I have watched all of Elizabeth's movies (minus the Mystery of Scent one) and most of Richard's movies. So yeah I agree it's an excellent movie. Also their language somehow makes it seem almost modern as it still resonates with young people today. I showed it to a bunch of adolescents I work with some three years ago and they really liked it. Then finally here's an old collage I've made. Very beautiful collage! . It would look amazing all blown up and put on a wall! Thanks @Ms Southworth . Are you a fan of Elizabeth? Also what's your favorite movie with Elizabeth & Richard? Elizabeth was in the magazines a lot while I was growing up! That's mostly where I know her from. I don't think that I've ever seen a whole movie with her (or Richard for that matter)! You're a very talented collage maker, Karin! Have you ever done any collages with the various Dallas couples? Also, do you only make collages onscreen, or do you also make them out of paper of various sorts (photos, magazines, etc.)? I know where you're coming from @Ms Southworth as I used to read about Elizabeth in the women's magazines long before I ever watched her movies. There was just something about her life that fascinated me. I only watched my first movie with her when I was a teeanger, which was "Cleopatra". I think I saw "Lassie" and "Cat on A Hot Tin Roof" back then too. But it wasn't until I watched "Who's Afraid of Virginia Woolf?" when I was in my late 20s that I got a craving to watch more of her work. You know I almost envy you since you have so many great movies left to discover if you're willing to give them a chance. I can definitely recommend you to watch movies like "Giant" (which Dallas was sort of inspired by), "Cleopatra", "Taming of the Shrew", "The Sandpiper", "Who's Afraid of Virginia Woolf?" Then as for collages, I started out making some with actual paper and photos when I was in my late teens and 20s. But that's as close as I've gotten to make a Dallas collage. I guess I am too busy with making fan videos and writing on my Dallas fanfic to spend time making photo collages too. Even though I suppose you can say the front pages for the fanfic episodes are sort of like different collages. But very small scale. Quite understandable that you don't have time for collage making with all the stuff that you've got going on in your life! But you are talented IMHO, and I would love, if you would post some more of your "old" collage work! Maybe in another thread, if it's not related to "movies! Thank you Ms Southworth. I hope you'll enjoy the Elizabeth movies. She is really an awesome actress. Unfortunately I have already reposted all the old collages I've made in this thread by now. So I figured I'd share some more old magazine scans instead. Elizabeth and Richard fell in love while filming Cleopatra and I think these images speaks for themselves. That's all for now. But enjoy the photos. I hope you'll enjoy your Elizabeth movies too when you get around to watch them. Very nice newspaper / magazine scans, Karin! PS. I saw the first 20-25 minutes of "Giant" last night! I hadn't realized that the movie is over 3 hours long, and when I did, I chose to put the movie away for another day! I was just too tired - plus I had to get up early today! But so far, "Giant" seems very intriguing, so I'm looking forward to find a day, where I can spare 3,5 hours without breaks! @Ms Southworth have you finished watching "Giant" yet? If not I suggest dividing it in two parts when watching it. That's what we did, as it is a long movie and well I think there originally was an intermission between the younger and older part so it makes sense to divide it there! Elizabeth on the set with Jimmy Dean and Rock Hudson. @Karin Schill, I thought that I'd get around to watching "Giant" at Easter, but no such luck, I'm afraid! But I'll get to it sooner or later! That I can promise you! BTW, I hope that you had a great Easter holiday! I'm actually looking forward to watch an old movie like "Giant"! When I was a young child, I would sometimes watch John Wayne movies with my dad. But other than that, I don't think that I've ever seen movies more than 50 years old! Thus, it's bound to be interesting! PS. Thanks for posting all those photos! @Ms Southworth have you found the time to watch the Elizabeth Taylor movies yet? I love watching classic movies. I tend to watch more classics than new movies. Sorry I couldn't scan some of them better, I think most of them are from different books so that's why the edges sometimes are a bit badly scanned. Thanks so much for sharing, @Karin Schill! Sorry, I haven't watched the movies yet! And now I have Tommie's books to tend to as well ... ... ... and also playing hostess to long-time family friends who will be staying with us for the next two weeks! Thus, it might be a while before I get around to the ET movies! Forgive me??? There's nothing to forgive. I sometimes buy movies and then put them on my "pile of movies to watch" for years before I get around to watching them. So you are not alone! I hope you will have a great time with your friends! But yeah do let us know what you think of the ET movies once you get around to watching them. Okay, @Karin Schill, I finally got around to watch the first half of "Giant" today! It's a great movie, I must say! Especially if you're a sucker to romance! In some weird ways, the movie sort of remind me of a mix of "The Thorn Birds" and "Dallas". Jordan and Leslie's stormy romantic relationship is something else! . I was quite shocked at the behavior of Jordan's sister, Luz, when he brings home his new bride to his huge Texas ranch! I never managed to figure out why Luz had so much hostility towards her sister-in-law. Suddenly, Luz was killed after riding Leslie's stallion! I'm afraid that there's a part of me that was not sorry that Luz passed on! Her brutal and unfriendly ways were beginning to annoy me! Jordan and Leslie first had twins and then soon after another child. My heart almost broke in two when Jordan forced his very young son to ride a horse, alhough the sweet little boy was crying and screaming out of fear and who knows what else! The newly wed days for Jordan and Leslie soon ended, and to give the, a break from each other, Leslie took the children for a long visit at her parents' house in Maryland. The time that Jordan and Leslie spent apart must have been good for them, because he does all of a sudden show up at his wife's parents place (because he's had time to reconsider things). Jordan and Leslie kissed and made up, before I had to turn off the movie for now! I hope that I'll be able to watch the rest of the great movie either Monday or Tuesday! I highly recommend the movie "Giant" with Elizabeth Taylor, Rock Hudson and James Dean. I'm loving it so far!